Mental Health Month, the month of May, has inspired me to finish a challenge I started several months ago. That challenge is my Psychology A to Z. I’m planning to finish this challenge over the next couple of months, if not sooner. I’m starting where I left off, “D”. And I’m starting with haiku for the first few letters. I may continue with haiku, or I may change it up. I’m not sure yet, but I plan to finish. Here I go. This week’s Haiku Heights prompt is Fortitude. 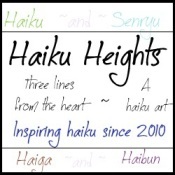 For more information on participating in Haiku Heights and rules of writing a Haiku click on the badge below. This week’s Haiku Heights prompt is Origami. For more information on participating in Haiku Heights and rules of writing a Haiku click on the badge below. I truly agree with this quote by Theodore Roosevelt. Usually, I find myself feeling hopeful and happy about my situation in life. However, when I start looking at someone elses situation (especially when my brain chemistry or hormones are out of whack and I’m depressed), I become even more depressed and anxious and self-conscious. I start to believe I am a failure, ugly, unsuccessful, stupid, poor, too heavy, or any variety of other bad situation. In reality none of these are true. To make matters worse, if I continue delving into this comparison mentality, I find myself silently in my mind putting other people down to make myself feel better from my initial comparisons. In the end, comparison becomes a sad, negative, counterproductive action. Instead of comparing, the graphic below shows a better alternative. Be the best you, you can be. I found the motivational graphics above on Pinterest. You can find more Pins by clicking on the graphics or going to pinterest.com. Want to play along? All that’s necessary to participate is to describe your life (or something) in a phrase using just six words. For more information, try clicking here. Feel free to explain or not explain. Add an image, a video, a song, nothing. I love seeing what everyone does with their entries. Click on the “Six Word Saturday” badge for more Six Word Saturday entries and details for today. It also makes a woman healthy, wealthy, and wise. I’ve adopted a new habit of going to sleep early and waking up early. I started developing this new habit this past week. So far, I have been getting to work earlier (wealth). I have fewer late night snacks and get enough sleep (health). And my mind, body, and soul feel calmer, and I have more quiet time for spiritual reading and prayer (health, wealth, and wisdom). I am planning to keep this up. Slowly, I move with the gloom. My last post was on the theme of “happy” for the WordPress weekly photo challenge. It is true that my family does bring me happiness and even when I’m depressed a smile comes out when I’m with them. I’ve been depressed the past couple of days. I even missed work yesterday because of it. The haiku I wrote above is a short summary of what I have felt the past two days. I was way too slow physically and mentally to accomplish my job. It use to be that when I felt this slow I would completely resign myself to sleep and just resting. I guess I have progressed in that area. I still do get some rest, but I have developed the philosophy of snails and tortoises. Although slow in comparison to all the other creatures, they continue to move. Realizing that I may need to sleep and rest a little more, but not so much more that my whole life comes to a stand still, I have learned to drag myself through the depression slowly and steadily with alternating rest and action. I realize that there’s no use in beating myself up about being slow and depressed. For me it’s sort of like having a cold in my brain. How it got there, I’m not sure, but right now I need rest and will be slow for a while. Even on my medication, this gloom happens to me every couple of months then vanishes. Eventually, I feel like myself again, but till then I rest a little, move a little, rest, move a little more, rest, and so on. I may not be all there, but I can get a little done. And that’s progress for me when progress feels almost impossible. The speed I go when I’m depressed. I found the cute cartoon above on Google. Is bipolar taking my husband’s joy? I’ve been feeling very sad and disappointed with my husband lately. It doesn’t seem like he has any ambition or desire to do anything except work, watch TV, surf the net on his iPhone, eat, and over sleep. He seems like he hasn’t touched me, karate, or his musical instruments in months. I guess it has been much more than 6 months, since he really showed any ambition to change jobs, help around the house, go to school, teach guitar, or practice or go to karate class. He says there’s nothing wrong and he just feels tired and just wants to rest. We went to our regular psychiatrist visit a couple of months back, and he said everything was fine to the psychiatrist. I was tempted to say more, but decided to let some time past to see what would happen. Still little change. At one time he told me he was hesitant to practice karate because it got him worked up. (If you don’t know a little of my husband’s history, he has Bipolar I Disorder. And often I don’t talk much about it because he’s been stable without problems until now.) He was afraid the mania would take hold of him. I now wonder if that is why he has avoided the other areas also. Haven’t seen any significant mania symptoms for months. It feels more like a depressive phase. He doesn’t want to read or have any hobbies. I want him to be happy, but I don’t understand exactly whats going on or how to help without upsetting him. He doesn’t spend much time with our son either. That also saddens me. He says our son doesn’t show interest in him, but my husband doesn’t even seem to try much to be interesting. We still go out to eat the three of us and watch movies, but not much else other than go to school and work. I wonder what kind of example this is for my son. I really do need to finish school, so I can dedicate more of my time to my family. My son is doing well in school and he enjoys karate, gaming, reading, computers, and playing his clarinet. I believe he will be fine, he is a smart kid. I’m worried about my husband. He’s turning out like his father. Work and TV and that’s it. I don’t want him to do that because he is scared of the bipolar or for any reason. I’m not sure what to do. I just had to vent and type this short post to express myself and keep myself from getting depressed at my husband’s situation. I’m at work now, but I am having difficulty concentrating thinking about my husband. Feeling like crying because I love him and want to help, but don’t know how. Like always, I believe, my family and I will find a way to resolve this problem in a postive way, but right now (despite my own sucesses at work, school, and motherhood) I’m feeling kind of miserable. One of the most difficult parts of dealing with anxiety is obsessive thinking and worrying. The haiku above is my brief illustration of what obsession tends to do in my life. Basically, it makes me depressed and keeps me from being the best mom, wife, woman I’m meant to be. Daily, I must remind myself to worry less and have faith and confidence. Really, everything will be okay. Sunday, after I put my son to sleep, I stated looking at the Facebook pages for classmates from high school. I should have been going to bed, but instead I was on the computer. And I started feeling sad. I started to compare. Some of these people look so perfect with their perfect friends and families. Some of them have more than one child. I felt bad that I can only handle one child. “Is there something wrong with me?”, I thought to myself. I would not fit in with these people. Once again I am an outcast, I don’t belong. It’s a bummer. I was only focusing on the negative.